Every year we end up with more of those plastic Easter eggs than we really need. I save so many to put in storage for next years family egg hunt but what do you do with all of the rest after they’ve been found and opened? 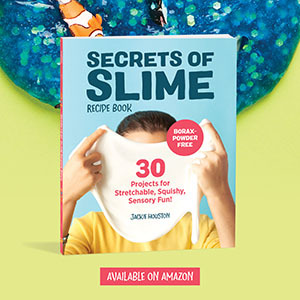 Surprisingly, besides holding treats these inexpensive eggs can be reused for games, educational activities, and some pretty adorable crafts. 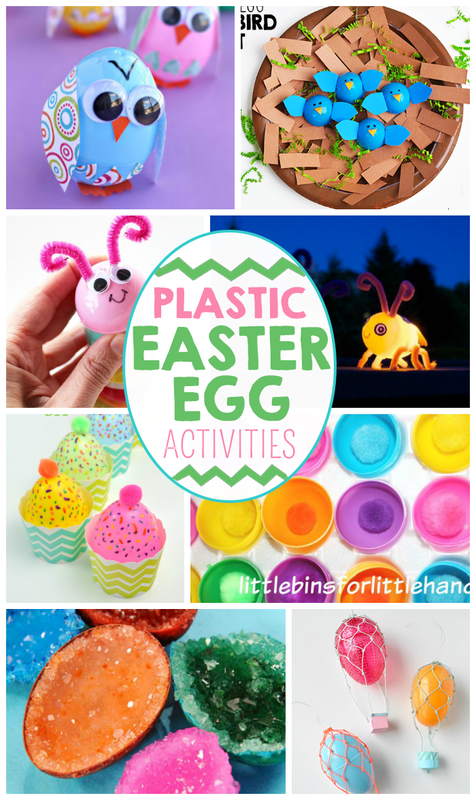 This year, after your kids are done with their Easter egg hunt reuse some of those plastic eggs for a fun Easter craft session! 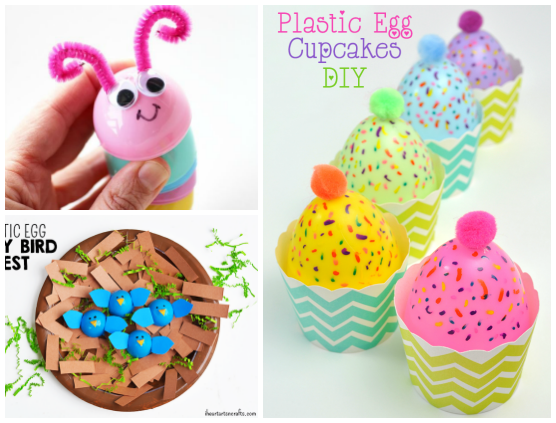 Check out some of my favorite ways to reuse plastic Easter eggs below. Click on the links below for the directions. Wobble Egg Minions – Turn the eggs into a fun DIY toy. Drip Painting With Plastic Eggs – A fun process art activity for preschoolers. Bumble Bee Egg Carton Hive – Use toilet paper rolls and plastic eggs to create this piece. 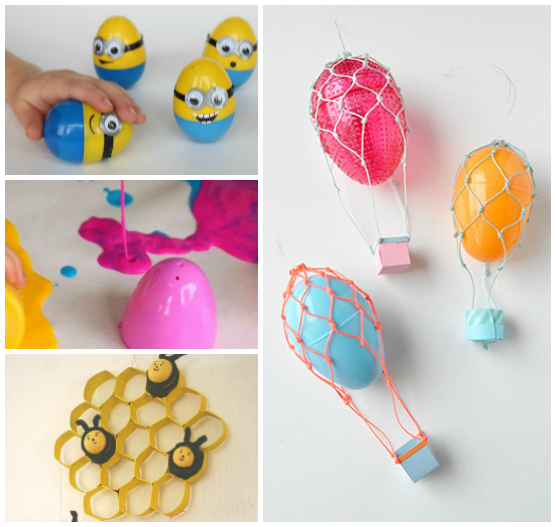 Easter Egg Hot Air Balloons – This is so creative! 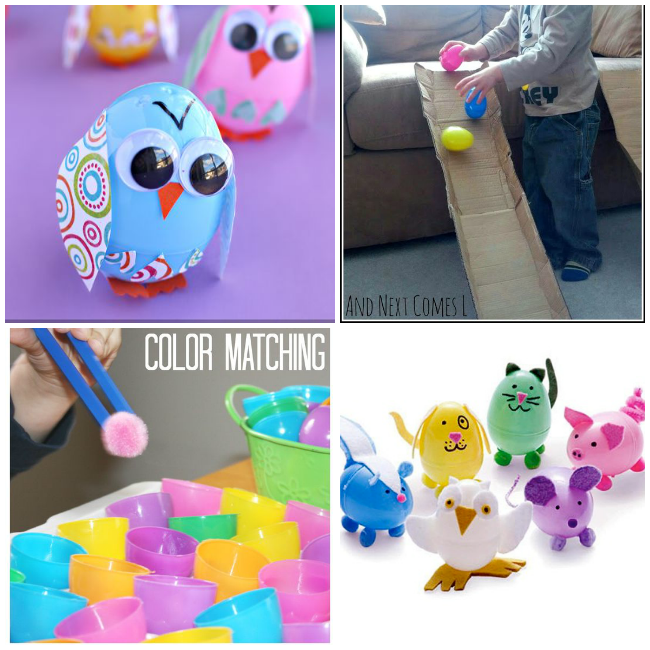 Plastic Egg Owls – Customize your own plastic egg chicks or owls. Wobbly Easter Egg Ramp Races – The perfect indoor boredom buster. 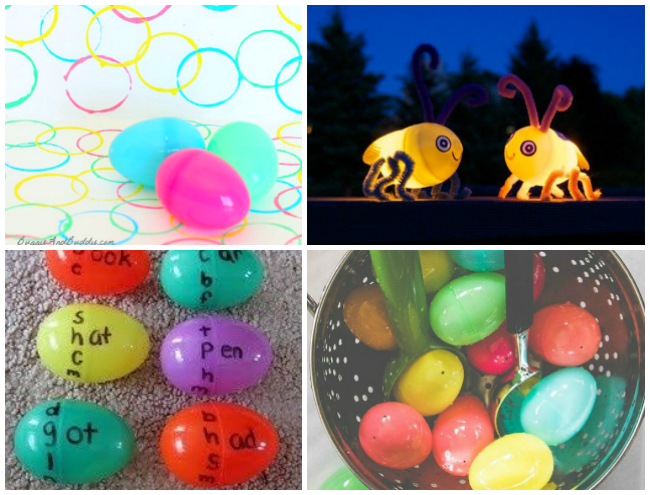 Easter Egg Color Matching – A fun Easter fine motor activity using eggs and pom poms! Eggimals – This is so clever! Make a herd of animals from just plastic eggs, felt, and glue. 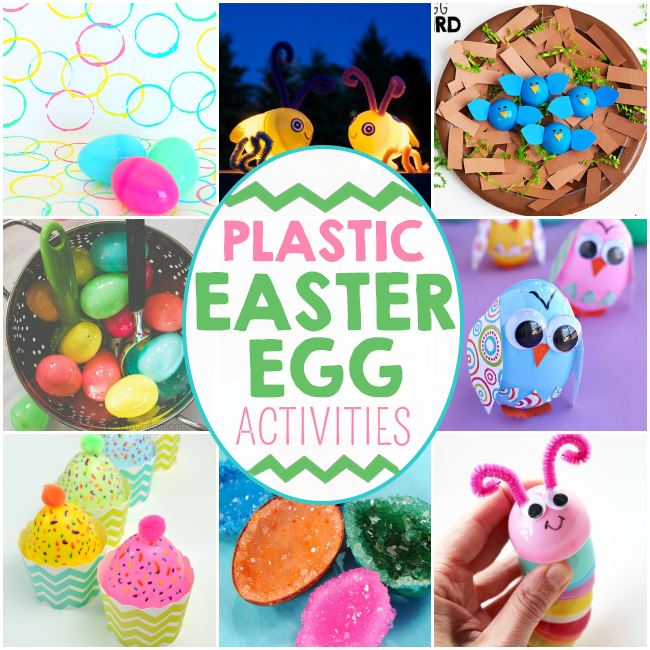 Painting With Plastic Eggs – An easy art project for those little hands. DIY Fireflies – These adorable bugs even light up! Word Family Eggs – You could leave a special treat in the egg that they can only open once they’ve got it right. She also shows you how she made it into a letter matching game as well! Egg Scoop – A sensory activity for babies and toddlers. You could also include some color matching in this sensory activity. Easter Egg Popsicles – Are these not the cutest popsicles ever?? 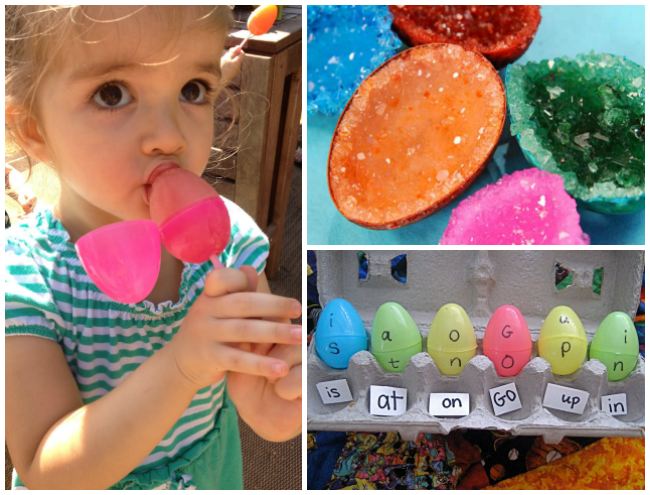 Crystal Egg Geodes – An Easter craft that doubles as a science experiment! The original post is from Martha Stewart and she uses real egg shells. However, Feels Like Home blog used plastic eggs in her version and didn’t see a difference. 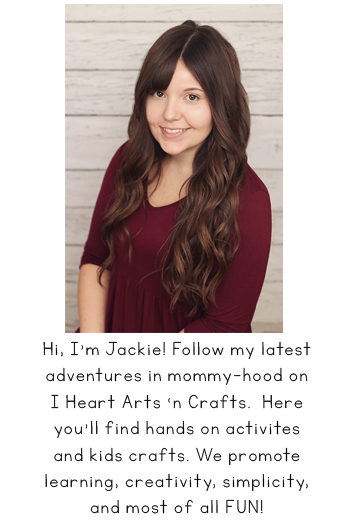 Check out her tutorial here. Early Spelling Game – This could be adapted for younger kids by using uppercase and lowercase letter matching. Caterpillars – These are so cute and the kids will love playing with them! Plastic Egg Cupcakes – Plastic egg cupcakes that actually glow. Plastic Egg Baby Bird Nest – You can use different colored eggs for different types of birds for this craft. Simple and so adorable!